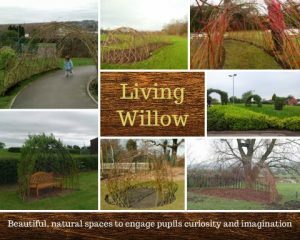 Our staff build Living Willow Structures in the winter months when there are no leaves on the trees, we can do this as an installation only or alongside your pupils, staff and even parents.The willow rods are pushed into the ground where they take root and grow. They can then be woven into all sorts of shapes from domes and tepees to sea monsters and dragons. As the weather warms leaves grow all over the structure and provide summer shade. The structures provide a great place for imaginative play or sharing a story. They also provide a perfect environment to develop communication skills. Bespoke pieces… like our sea monster! You can see what other schools have had here. If you were interested in maintenance for Living Willow Structures click here.